Connexin channels participate in the regulation of signaling between developing and differentiated cell types. The connexins are a family of integral membrane proteins that oligomerise to form intercellular channels that are clustered at gap junctions. These channels are specialised sites of cell-cell contact that allow the passage of ions, intracellular metabolites and messenger molecules (with molecular weight less than 1-2kDa) from the cytoplasm of one cell to its opposing neighbours. They are found in almost all vertebrate cell types, and somewhat similar proteins have been cloned from plant species. Invertebrates utilise a different family of molecules, innexins, that share a similar predicted secondary structure to the vertebrate connexins, but have no sequence identity to them [(PUBMED:9769729)]. Vertebrate gap junction channels are thought to participate in diverse biological functions. For instance, in the heart they permit the rapid cell-cell transfer of action potentials, ensuring coordinated contraction of the cardiomyocytes. They are also responsible for neurotransmission at specialised 'electrical' synapses. In non-excitable tissues, such as the liver, they may allow metabolic cooperation between cells. In the brain, glial cells are extensively-coupled by gap junctions; this allows waves of intracellular Ca2+ to propagate through nervous tissue, and may contribute to their ability to spatially-buffer local changes in extracellular K+ concentration [(PUBMED:7685944)]. The connexin protein family is encoded by at least 13 genes in rodents, with many homologues cloned from other species. They show overlapping tissue expression patterns, most tissues expressing more than one connexin type. Their conductances, permeability to different molecules, phosphorylation and voltage-dependence of their gating, have been found to vary. Possible communication diversity is increased further by the fact that gap junctions may be formed by the association of different connexin isoforms from apposing cells. However, in vitro studies have shown that not all possible combinations of connexins produce active channels [(PUBMED:8811187), (PUBMED:8608591)]. Two sets of nomenclature have been used to identify the connexins. The first, and most commonly used, classifies the connexin molecules according to molecular weight, such as connexin43 (abbreviated to Cx43), indicating a connexin of molecular weight close to 43kDa. However, studies have revealed cases where clear functional homologues exist across species that have quite different molecular masses; therefore, an alternative nomenclature was proposed based on evolutionary considerations, which divides the family into two major subclasses, alpha and beta, each with a number of members [(PUBMED:1320430)]. Due to their ubiquity and overlapping tissue distributions, it has proved difficult to elucidate the functions of individual connexin isoforms. To circumvent this problem, particular connexin-encoding genes have been subjected to targeted-disruption in mice, and the phenotype of the resulting animals investigated. 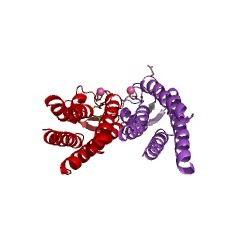 Around half the connexin isoforms have been investigated in this manner [(PUBMED:9861669)]. Further insight into the functional roles of connexins has come from the discovery that a number of human diseases are caused by mutations in connexin genes. For instance, mutations in Cx32 give rise to a form of inherited peripheral neuropathy called X-linked dominant Charcot-Marie-Tooth disease [(PUBMED:7570999)]. Similarly, mutations in Cx26 are responsible for both autosomal recessive and dominant forms of nonsyndromic deafness, a disorder characterised by hearing loss, with no apparent effects on other organ systems. There are 6548 CNX domains in 6512 proteins in SMART's nrdb database. Taxonomic distribution of proteins containing CNX domain. This tree includes only several representative species. The complete taxonomic breakdown of all proteins with CNX domain is also avaliable. Click on the protein counts, or double click on taxonomic names to display all proteins containing CNX domain in the selected taxonomic class. Connexins, gap junctions and cell-cell signalling in the nervous system. Connexins form a multigene family of polytopic membrane proteins that, in vertebrates, are the constitutive subunits of intercellular channels and provide the structural basis for electrical coupling. The appearance of electrical coupling in the nervous system is developmentally regulated and restricted to distinct cell types. Electrical coupling between neurons persists after the establishment of chemical transmission, thus suggesting that this form of cell-cell signalling may be functionally interrelated with, rather than alternative to chemical transmission. Furthermore, evidence for the possible role of gap junctions in human neurological diseases is also mounting, following the discovery that the X-linked form of Charcot-Marie-Tooth syndrome, a demyelinating neuropathy of the peripheral nervous system, is associated with mutations in a connexin gene. These findings raise new questions on the significance of connexin diversity and on their functional role in the nervous system. Projection structure of a gap junction membrane channel at 7 A resolution. Electron cryo-microscopy and image analysis of frozen-hydrated, two-dimensional crystals of gap junction membrane channels formed by recombinant alpha 1 connexin (Cx43) reveal a ring of transmembrane alpha-helices that lines the aqueous pore and a second ring of alpha-helices in close contact with the membrane lipids. The cellular Internet: on-line with connexins. Most cells communicate with their immediate neighbors through the exchange of cytosolic molecules such as ions, second messengers and small metabolites. This activity is made possible by clusters of intercellular channels called gap junctions, which connect adjacent cells. In terms of molecular architecture, intercellular channels consist of two channels, called connexons, which interact to span the plasma membranes of two adjacent cells and directly join the cytoplasm of one cell to another. 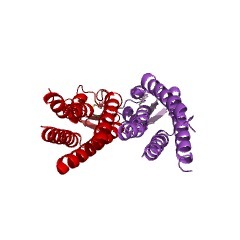 Connexons are made of structural proteins named connexins, which compose a multigene family. Connexin channels participate in the regulation of signaling between developing and differentiated cell types, and recently there have been some unexpected findings. First, unique ionic- and size-selectivities are determined by each connexin; second, the establishment of intercellular communication is defined by the expression of compatible connexins; third, the discovery of connexin mutations associated with human diseases and the study of knockout mice have illustrated the vital role of cell-cell communication in a diverse array of tissue functions. Connections with connexins: the molecular basis of direct intercellular signaling. Adjacent cells share ions, second messengers and small metabolites through intercellular channels which are present in gap junctions. This type of intercellular communication permits coordinated cellular activity, a critical feature for organ homeostasis during development and adult life of multicellular organisms. Intercellular channels are structurally more complex than other ion channels, because a complete cell-to-cell channel spans two plasma membranes and results from the association of two half channels, or connexons, contributed separately by each of the two participating cells. 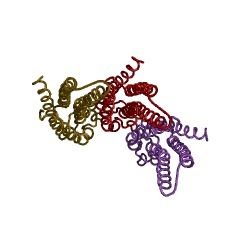 Each connexon, in turn, is a multimeric assembly of protein subunits. 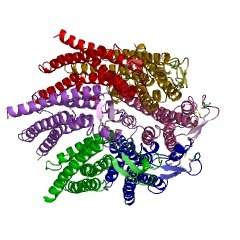 The structural proteins comprising these channels, collectively called connexins, are members of a highly related multigene family consisting of at least 13 members. Since the cloning of the first connexin in 1986, considerable progress has been made in our understanding of the complex molecular switches that control the formation and permeability of intercellular channels. Analysis of the mechanisms of channel assembly has revealed the selectivity of inter-connexin interactions and uncovered novel characteristics of the channel permeability and gating behavior. Structure/function studies have begun to provide a molecular understanding of the significance of connexin diversity and demonstrated the unique regulation of connexins by tyrosine kinases and oncogenes. Finally, mutations in two connexin genes have been linked to human diseases. The development of more specific approaches (dominant negative mutants, knockouts, transgenes) to study the functional role of connexins in organ homeostasis is providing a new perception about the significance of connexin diversity and the regulation of intercellular communication. Connexins, connexons, and intercellular communication. Cells in tissues share ions, second messengers, and small metabolites through clusters of intercellular channels called gap junctions. This type of intercellular communication permits coordinated cellular activity. Intercellular channels are formed from two oligomeric integral membrane protein assemblies, called connexons, which span two adjacent cells' plasma membranes and join in a narrow, extracellular "gap." Connexons are formed from connexins, a highly related multigene family consisting of at least 13 members. Since the cloning of the first connexin in 1986, considerable progress has been made in our understanding of the complex molecular switches that control the formation and permeability of the intercellular channels. Analysis of the mechanisms of channel assembly has revealed the selectivity of inter-connexin interactions and uncovered novel characteristics of the channel permeability and gating behavior. Structure-function studies provide a molecular understanding of the significance of connexin diversity and demonstrate the unique regulation of connexins by tyrosine kinases and oncogenes. SwissProt sequences and OMIM curated human diseases associated with missense mutations within the CNX domain. This information is based on mapping of SMART genomic protein database to KEGG orthologous groups. Percentage points are related to the number of proteins with CNX domain which could be assigned to a KEGG orthologous group, and not all proteins containing CNX domain. Please note that proteins can be included in multiple pathways, ie. the numbers above will not always add up to 100%.